In 1982 the Dutch artist Nicolaas van Beek travelled to Kashmir to work on the designs for a tarot deck which would unite Eastern esoteric concepts of the chakras with Western tarot imagery. 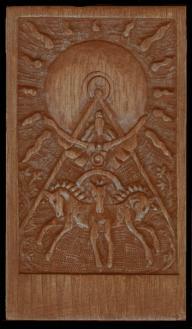 Having created designs on paper he decided to make a wooden deck in bas-relief on small plaques of walnut. The first deck he made himself, but during this time he met a highly skilled Kashmiri wood carver called Abdul Salama, and commissioned him to help with making a further seven decks. On his return to the Netherlands van Beek decided to work his designs into a printed form, using serigraphy. He worked for nearly two years with some assistance from Dutch artist Dik Al to make these complex serigraphs, which used many layers (up to twenty) of ink on a card. The "deck" consists of 22 plaques of walnut about 1/4 of an inch (6mm) thick and around 3 1/2 inches (88mm) high by 2 inches (50mm) wide. These were smoothed and polished and the carving made in low relief in an off-centred window set into the upper surface. 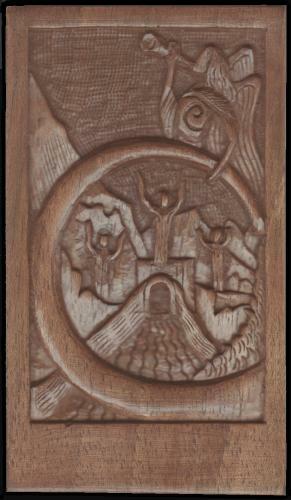 This offsetting of the carved area immediately gives the impression of a tarot card with space at the bottom for text. There is no card title or number but as the designs closely reflect the established tarot arcana there is no problem in recognising the arcanum being depicted. The image stands out from a background which is textured with a punch hammered into the carved away surface. The forms of the image are for the most part smooth, being cut by a sharp chisel, and perhaps later burnished. Walnut is a hard wood with a fine grain, and it thus supports fine relief lines, which are stable and not easily damaged, as they can be on softer or more coarsely grained woods. Kashmir is home to the finest quality of walnut wood in the world and is the only state in India where walnut grows. 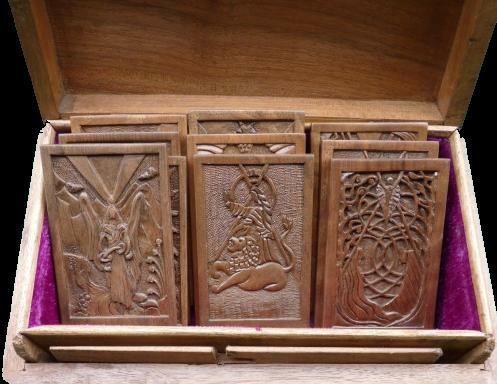 Kashmiri craftsmen are renowned for their fine carving in walnut, and the Kashmir Tarot is a prime example of this skill. In comparing my copy with the photographs of another copy in Kaplan's Encyclopedia Vol III, I noticed many variations in the carvings. Thus these were not mere slavish copies, but each image was created anew reflecting the individual structure of the grain of the pieces of wood and the creative exploration of the carver as he worked through making seven copies of each image. Here we can see this tooled background on the Sun plaque. 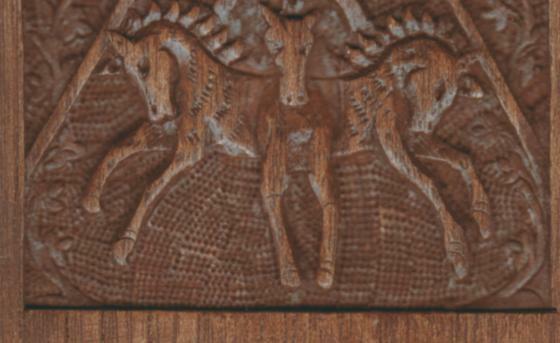 Here we can see another feature of the carving, the higher foreground of the three horses and an intermediate layer of vegetation (here towards the right and left edges) lying between this and the background. Ths subtle feature helps give a sense of depth to the imagery. This creation of layers to give depth to the image is perhaps carried to its full extent in Judgement. Here we find the spiraling circular energy form closest to us, with a path to a gateway into a graveyard behind, and behind this the figures arising from their tombs with mountains set behind them and finally the background sky with the trumpeting angel upon it. 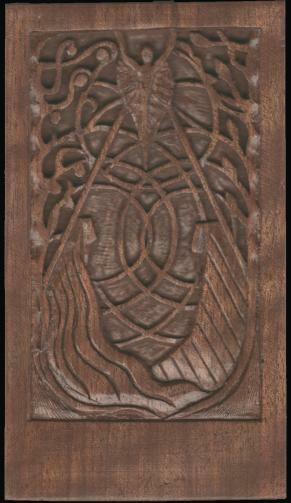 The carver controls our perception of depth and locates these different elements within the space of the emblem. 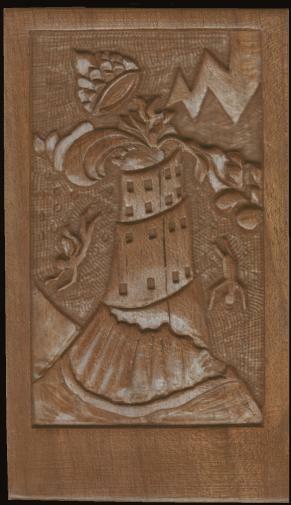 Some of the imagery is conventional tarot, and example of which is The Tower. In other designs van Beek incorporates lines of rays and circles of energy, reflecting his interest in the chakras. We see this clearly in The Lovers. ...to be continued Tarot exhibitions.